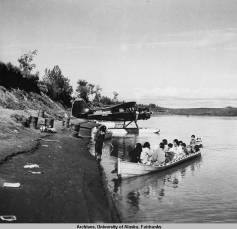 Meeting the Northern Consolidated Airlines mail plane on the Kuskokwim River, 1950s. UAF-1991-98-672, Kay J. Kennedy Collection, University of Alaska Fairbanks Archives. Alaska’s larger archival research facilities that house collections of original documents, maps, photographs, and films. They offer finding aids, on-line research tools, and staff who can help you find what you seek.